Being heavily invested in the travel hacking game, I thought I knew most of the ways one could earn miles. We all know we can earn miles from credit cards, bank accounts, brokerage accounts and even for filling out surveys, dining out, shopping online etc., but I just learned about a new method I’ve never heard about. You can earn thousands of miles for booking golf tee times with Golfmiles and I’ve partnered up with them to offer PointsCentric readers an exclusive 1,500 bonus miles on your first booking. Plus they are giving away 50,000 miles to celebrate their launch! This offer is exclusively for PointsCentric readers! Golfmiles is a new startup that is essentially an online booking site that aggregates all the available tee times at participating courses and rewards you with miles for every tee time through them. Golfmiles sounds quite similar to Rocketmiles or PointsHound but instead of hotel rooms, it is for rounds of golf instead. Golfmiles claims to have over 6,000 participating courses at this time. I’ve been playing around on the site which offers an easy, user friendly interface that seems to offer a wide range of options from the testing I’ve done. To test it, I searched for tee times for next weekend on Long Island and also searched for a tee time next Wednesday to see how the results compared. Perhaps unsurprisingly, there was a ton more availability on the weekday instead of the weekend. For next Wednesday, you can book almost 600 different tee times across 31 different courses. Depending on the course and tee time, you could earn anywhere from 100 miles to 1440 miles and that’s before the 1,500 bonus miles for your first booking. Looking at the results for a tee time next weekend, there are less tee times available but interestingly the mileage payouts are a little bit higher. I was little surprised to see that but perhaps the course isn’t as nice (I’m not familiar enough with the courses to say). If you combined the first booking bonus of 1,500 miles to the below, that’s 3,420 miles for booking a single round of golf – not too shabby! The big question about Golfmiles is whether their prices were competitive and in my limited testing, it certainly appears so. In almost every case I was able to match the rate Golfmiles produced to the rate on the course’s website though in come cases I couldn’t find the same tee times available on the course’s website. 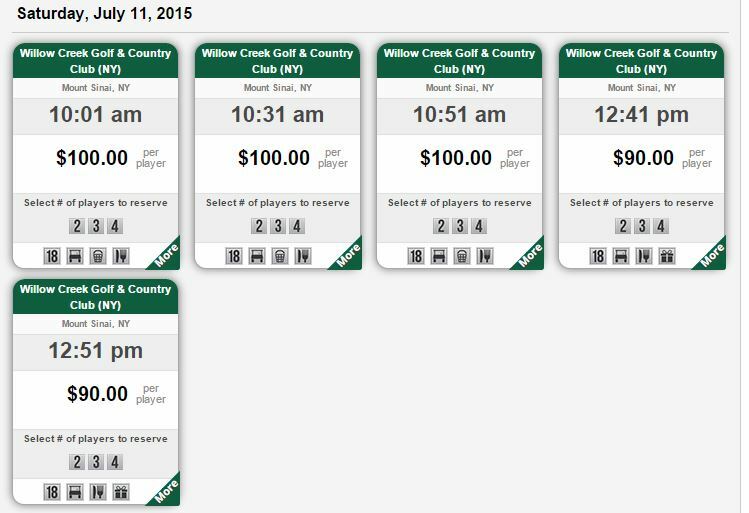 For instance, the Willow Creek Golf booking above was not available on the course’s site but the times surrounding indicate the rate from Golfmiles is actually cheaper. As mentioned earlier, I worked with Golfmiles to offer my readers an extra 1,500 bonus miles on your first booking if you signup via my link here. In the interest of full disclosure, I will receive a small amount of miles for every person who signs up for Golfmiles via my link and books a round of golf through them. To my knowledge, this is the best current offer for signing up for Golfmiles as I’ve been told this offer is only available through my referral link. Additionally, to celebrate their launch Golfmiles is giving away 50,000 miles and non-golfers are eligible as well. You do not need to signup for Golfmiles to be eligible. Simply enter here via this link and fill out some basic information. It will be interesting to see if Golfmiles takes off but it is always nice to see another option for earning extra miles for activities you already do. If anyone has any questions about Golfmiles, please let me know and I’ll be happy to forward them on to my contact. What are your thoughts on Golfmiles?